It’s hard to believe the holidays are upon us already. The days seem to just fly by. Reminder – our November meeting is a week earlier than normal because of Thanksgiving. The meeting is the second Tuesday – November 13. Our speaker will be Rayna Gillman. You may remember that Rayna was one of the Invitational Quilters at our 2017 show. We are pleased to have her return to the guild and talk about her work. At our November meeting we will also be holding the Holiday Boutique. It will take place starting at 6:00 in the lobby area just outside the auditorium (no stairs to climb). Make sure you bring extra cash so you can buy something from one of our vendors. I dropped off two Comfort Quilts today at Kennedy Catholic. Every year the school holds an auction to raise money. Sister Barbara use to donate wardrobes containing several “American Girl” doll outfits she sewed as an auction item. With her passing the Guild started donating a Comfort Quilt in her memory to replace them. The auction takes place on Saturday, November 10 starting at 6pm and the admission price includes dinner and drinks. It looks like they have lots of auction items. If you are interested, more information can be found at kennedycatholic.org/auction. Finally, I want to write once again about volunteering to help at the Guild. Last month’s meeting was a good example of our problem when we were unable to find a volunteer to staff the Library table for the evening. As a result there was no library in October. It is hard to run an organization such as ours that relies on volunteers to do the work when we lack volunteers. 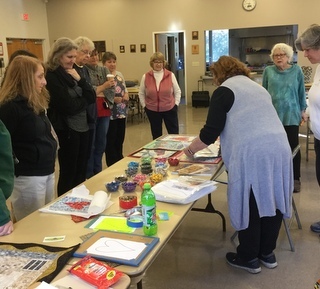 Other than at the quilt show, only a small percentage of our membership gets involved with working on one of our committees or activities. As the New Year approaches we will start looking to fill the slate for next year’s Board and I hope our search will go better than last year. Please consider getting involved, we cannot depend upon the same people to do the work each year. There are plenty of opportunities – some big and some small – where we can use your help. Let me know if you are willing to become more involved, and we can find something that will fit your interests and time constraints. I look forward to seeing you on November 13th.